DVD Reviews: The Wiggles - Whoo Hoo! 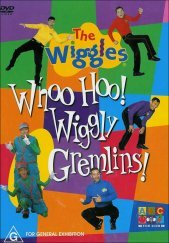 Wiggly Gremlins! The Wiggles bring their magic to the small screen again in their latest adventure. This series was initially aired on the ABC network as Network Wiggles. Some of these episodes ran for about 15 minutes each, I know as I sat through them each morning as my daughter danced and clapped along with the guys. Whilst it doesn't appear to repeat the action verbatim, many of the songs and skits were originally on the television show from what I can see. The main focus of the story is on how the Wiggly Gremlins get stuck into Network Wiggles and make life hard for the team with their crazy antics. The Wiggles are about in their Big Red Car and Captain Feathersword is left in charge of Network Wiggles. All sorts of funny tricks are played on the team by the Gremlins driving them barmy! As always this DVD is a lot of fun and the kids will love it. The sets are bright, the dances are fun and the songs are easy for little ones to pick up and be singing in no time. There are a number of extras in this package that flesh it out even more than the wonderful feature that provide even more bang for the discriminating toddlers buck! There is a whole episode from the TV show to keep the fun coming when you think it's all over as well. Another neat feature is the jukebox song selection that allows you to jump from one song to the next. This DVD is presented in full screen format and stereo audio. There are no real faults as far as the transfer goes and all thing said and done it's another great addition to your children's collection of the ABC DVD series! I must confess that as a father to two small children that the Wiggles time and again impress me with their good natured ways in entertaining and educating the kids. Episode from "Lights Camera Action Wiggles!"